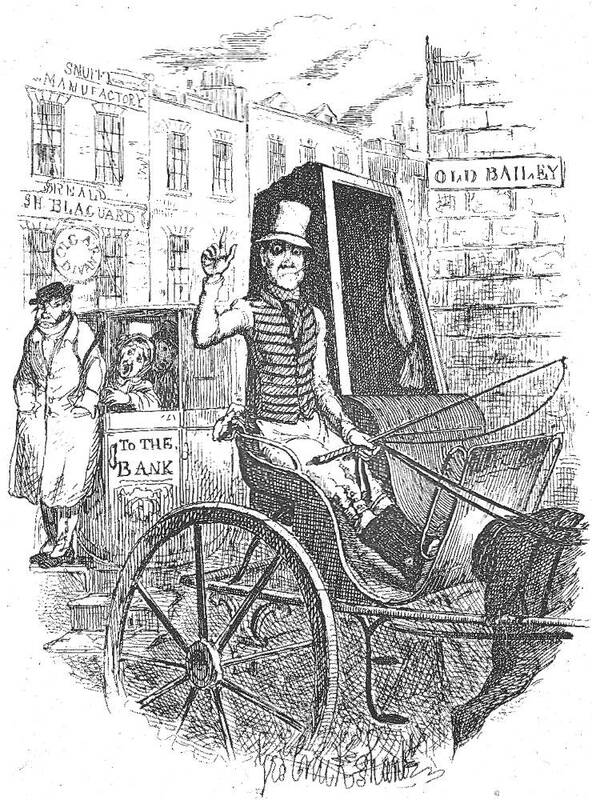 "The Last Cab-driver — Sol Eytinge, Jr.'s third illustration for Dickens's "Sketches by Boz"
Dickens's Christmas Books & Sketches by Boz, Illustrative of Every-day Life and Every-day People (Diamond Edition), facing p. 305. After the heart-warming, sentimental seasonal tales which Dickens wrote between 1843 and 1848, this volume of the Diamond Edition, commemorating Dickens's Second American Reading Tour, features seven scenes from Dickens's earliest work, "Our Parish," the twenty-five chapters from "Scenes," and twelve chapters from "Characters," the text established by Chapman and Hall in 1839. The last time we saw our friend was one wet evening in Tottenham Court Road, when he was engaged in a very warm and somewhat personal altercation with a loquacious little gentleman in a green coat. Poor fellow! there were great excuses to be made for him: he had not received above eighteenpence more than his fare, and consequently laboured under a great deal of very natural indignation. The dispute had attained a pretty considerable height, when at last the loquacious little gentleman, making a mental calculation of the distance, and finding that he had already paid more than he ought, avowed his unalterable determination to "pull up" the cabman in the morning. "Now, just mark this, young man,"​ said the little gentleman, "I'll pull you up to-morrow morning." "No! will you though? "​ said our friend, with a sneer. "I will," replied the little gentleman, "mark my words, that's all. If I live till to-morrow morning, you shall repent this." There was a steadiness of purpose, and indignation of speech, about the little gentleman, as he took an angry pinch of snuff, after this last declaration, which made a visible impression on the mind of the red cab-driver. He appeared to hesitate for an instant. It was only for an instant; his resolve was soon taken. "You'll pull me up, — will you? "​ said our friend. "I will,"​ rejoined the little gentleman, with even greater vehemence an before. "Very well,"​ said our friend, tucking up his shirt sleeves very calmly. "There'll be three veeks for that. Wery good; that'll bring me up to the middle o' next month. Three veeks more would carry me on to my birthday, and then I've got ten pound to draw. I may as well get board, lodgin', and washin', till then, out of the county, as pay for it myself; consequently here goes!" So, without more ado, the red cab-driver knocked the little gentleman down, and then called the police to take himself into custody, with all the civility in the world. — "Scenes," Chapter 16, "The Last Cab-driver, and the First Omnibus Cad," p. 307. Eytinge's conception of London prior to his actually visiting the British metropolis must have been rather vague; nevertheless, in this illustration an area railing (left rear) and a house front establish that this as an urban setting. 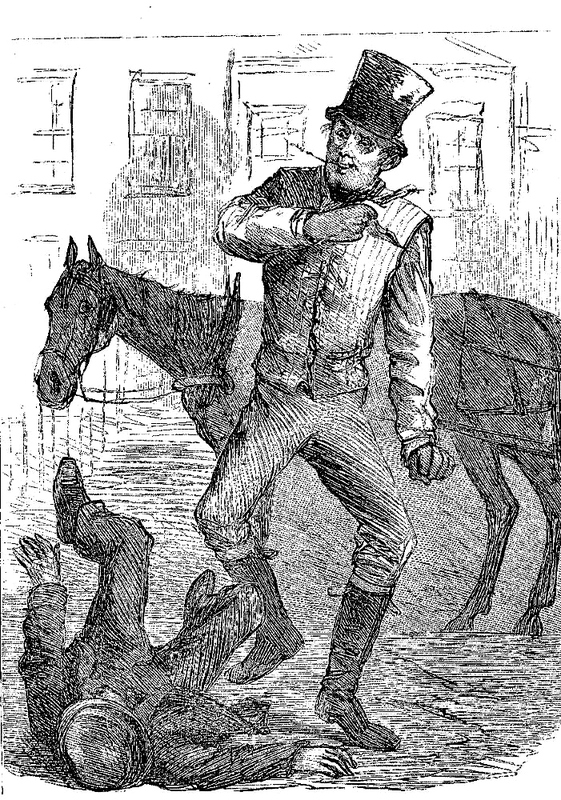 The horse regards the trouncing of the unruly customer with a serene objectivity, while the driver, a straw between his teeth, seems to be enjoying kicking the complainant. 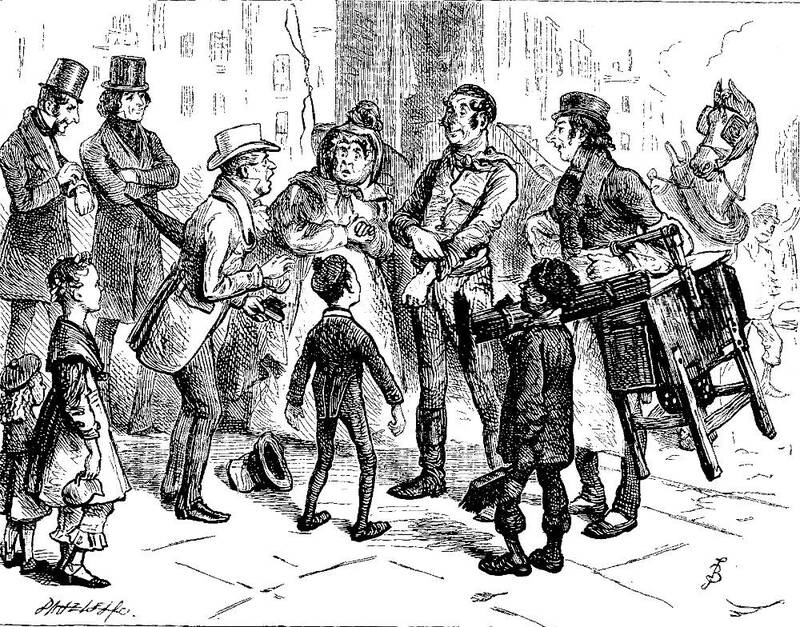 In the parallel Household Edition wood-engraving of 1876, Fred Barnard shows an array of bystanders as the little passenger, umbrella under his arm, delivers his complaint about the fare as the cab-driver calmly rolls up his cuffs in preparation for the beating he is about to deliver before eight witnesses at Tottenham Court Road (the sidewalk and buildings sketched in lightly in linear perspective establish the urban setting). 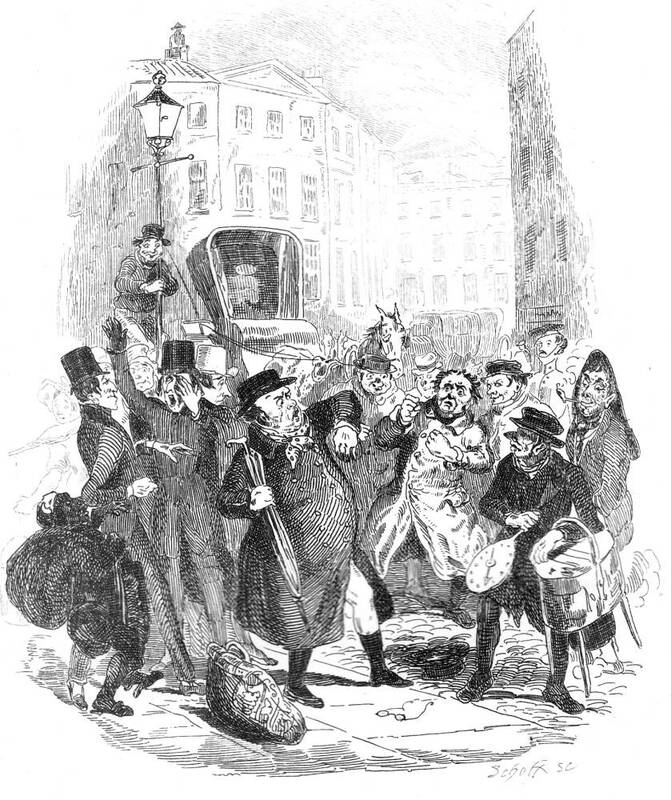 But in the original illustration by George Cruikshank, The Last Cab-driver (1839), despite a realistic urban setting with house- and business-fronts and a street sign, the witnesses in the background are a Cruikshank interpolation as they come from the second half of the sketch. Indeed, Dickens does not allude to there being any witnesses, except, of course, the highly observant "Boz" himself. The illustrator's point of attack, as it were, is interesting in that it comes after the customer has complained and the cab-driver has commenced thrashing him. Dickens, Charles. "Scenes," Chapter 17, "The Last Cab-driver, and the First Omnibus Cad," Sketches by Boz. Illustrated by George Cruikshank. London: Chapman and Hall, 1839; rpt., 1890. Pp. 104-111. Dickens, Charles. "Scenes," Chapter 17, "The Last Cab-driver, and the First Omnibus Cad." Christmas Books and Sketches by Boz, Illustrative of Every-day Life and Every-day People. Illustrated by Sol Eytinge, Jr. The Diamond Edition. Boston: James R. Osgood, 1875 [rpt. of 1867 Ticknor & Fields edition]. Pp. 305-310. Dickens, Charles. "Scenes," Chapter 17, "The Last Cab-driver, and the First Omnibus Cad." Sketches by Boz. Illustrated by Fred Barnard. The Household Edition. London: Chapman and Hall, 1876. Pp. 66-71 . Dickens, Charles. "Scenes," Chapter 17, "The Last Cab-driver, and the First Omnibus Cad." Sketches by Boz. Illustrated by Harry Furniss. The Charles Dickens Library Edition. London: Educational Book Company, 1910. Vol. 1. Pp. 133-142.